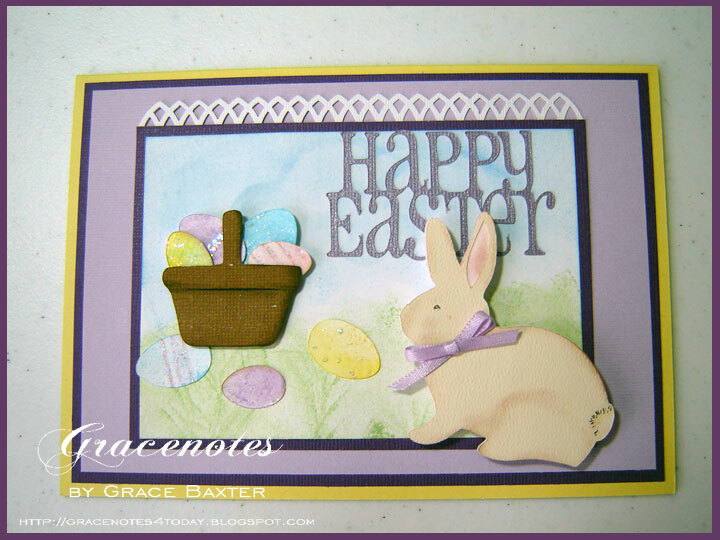 Here is my first Easter card for this year. 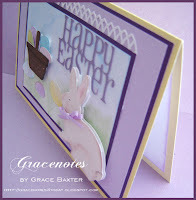 This 5" x 7" yellow base is complemented by dark purple and lilac frames. The lattice edging was done with MS lattice punch. For the bunny scene background, I sponged sky, clouds and grass over white CS. The bunny is cut at size 2.67w x 2.63h three times (cut at 2-1/2 if not using Gypsy); once from cream artist's cardstock and two from white on blackout. Artist's paper has a wonderful texture to it that really looks fluffy. On the white blackout bunny, I sponged his right ear with pink and shadowed it a bit for depth. The top bunny layer cuts away that part of the ear so the pink underneath shows through. 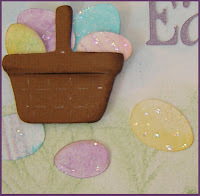 The two layers are glued together, then popped with dimensional dots to the remaining white bunny. I tied a mauve bow around all layers of his neck. The finished bunny is then popped again to the card. I lightly sponge shaded around the bunny in the appropriate places, being careful to make sure his haunches showed up nicely. You'll see the detail better by clicking the above image. For shading the bunny, I didn't want anything too dark. I used a soft brown eye shadow, applying it lightly at first, blending and adding more until I achieved exactly the look I wanted. I used this technique inside the ear too, over top of the pink sponged paint. I love how the bunny looks! I had to use my Gypsy in order to make eggs at 3 varying sizes, and small enough to fit several in the basket. Eggs are arranged in the basket, taped at the back. Egg sizes: 0.75w x 1.0h, 0.64w x 0.85h, 0.53w x 0.70h. 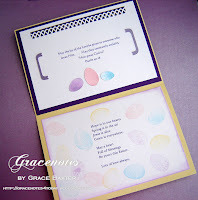 I cut the eggs from white cardstock and sponge painted them in pastel colours. Then I added some shading and glitter paint dots for sparkle. 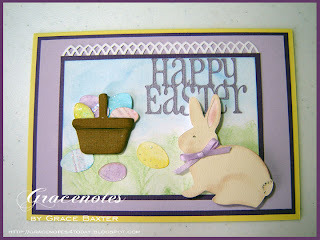 The basket is from Everyday Paper Dolls. I cut mine at 1.77 x 4.09 using my Gypsy. It sounds big but really isn't. The finished basket of eggs is "popped" to the card. I had a hard time finding the right kind of Easter basket. I searched through all carts on my Gypsy and it only came up with one that was kind of flat... used more for gathering flowers than eggs. Then I did a detailed browse through every page and accessory shown in the Everyday Paper Dolls book. It's amazing how many great items can be found in the accessories! If you haven't paid much attention to what the accessory feature keys can cut, do yourself a favor and take a look. 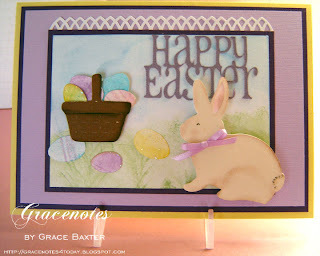 I'm sure you will be inspired with ideas for all kinds of cards. I know I was! A dark purple panel was used for contrast. The inside poem and Bible verse were prepared on my computer, printed on white cardstock (not paper). I punched the lattice fence on the top panel then added some brackets to enclose the quote. The three eggs were from the same bunch made as described above. I'm so glad I was able to use a stamp package I purchased long ago. There are four different designs and I purposely made them faint so as to not overpower the page. I used the same inks as for the cut eggs. The panel then received a mauve inking all around the edges. Here's another pic in different lighting. Would you please take part in the poll at the top left side bar? I spend time giving a lot of details about how I make my cards. Maybe it's too much reading. Or perhaps you DO want to know how I did it. I'd like to know your opinions, and based on the poll results, I will make future postings with your preferences in mind. Thanks for helping, and for dropping by! Your Easter card is just lovely! The inking on the background paper is just perfect. So many pretty details. Just became a follower and look forward to visiting often. What a beautiful and delicate card. Love the pastels. Thanks for sharing with us at CCC.